How do you know when the humidity is too low for your guitar? It’s June and the humidity is up in Boston. My guitars don’t need to hide in their cases. But how do I know the humidity is in the safe zone and come Autumn, will I be able to tell when the humidity has dropped into the danger zone (less than 40% RH)? I have three digital humidity gauges to monitor the humidity in the room. I’m set right? When the humidity drops below 40% my guitars go into their cases or into my humidified guitar cabinet. There is only a brief part of the year here in New England when the humidity is high enough to leave my guitars out in the open for any period of time. For close to 3/4th of the year the humidity in my study is too low – often under 20% in the middle of winter if I don’t run a humidifier. But look at the readings on these digital instruments. They are sitting next to each other and should be the same, but they aren’t. One of them is very different from the others. How do I know if any of these are correct? 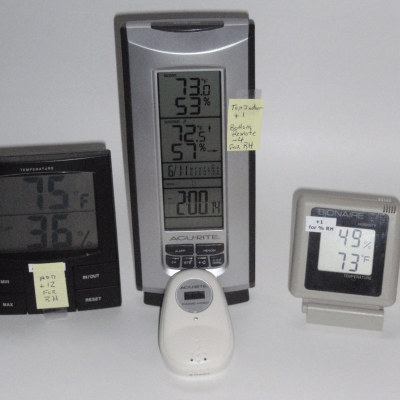 I could just buy a new digital hygrometer – but how would I know if a new one was any more accurate them any of those in the picture? I need a way to calibrate them. In another life I was a scientist and often had to calibrate instruments. However, the method I’m going to describe is not a multi-point calibration against a traceable certified standard. Instead it is something you might be able to do at home to determine if your digital hygrometer is accurate enough to warn you of low humidity that could be harmful to your guitar. I built myself a wet bulb psychrometer. Ideally you need an old fashioned liquid filled glass thermometer that has an accessible bulb at the bottom. Cover the bulb with a wet cotton ball or perhaps wrap it in damp cotton gauze (from your first aid supplies). You might be able to use an electronic or dial thermometer with a probe (think kitchen thermometer – however the temperature range will probably be skewed to high temperatures and in fact might not go low enough to measure room temperatures). 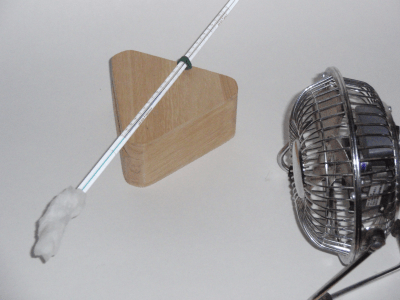 I’ve setup a fan to blow air across the wet cotton ball that surrounds the end of the thermometer. This will evaporate the moisture in the cotton ball and reduce the temperature reading on the thermometer. You will also need another thermometer to measure the normal air temperature. This can be from any thermometer including a digital model. But it should be setup next to your wet bulb thermometer. Now let the fan run for awhile so the readings can become steady. When the wet bulb reading is constant note the temperatures on the wet and dry thermometers. You need to know the dry reading and the difference between the dry and the wet reading in order to determine the Percent Relative Humidity (%RH). The classic way to determine the %RH is to look it up in a table. The results of my first experiment were: “dry” temperature was 76 degrees F and the “wet” reading was 65 degrees F, a difference of 11 degrees. Look for the intersection of the dry reading on the left and the difference across the top and the resulting %RH is 55%. One of my digital hygrometers read 43%. A big error. I should probably replace that hygrometer. 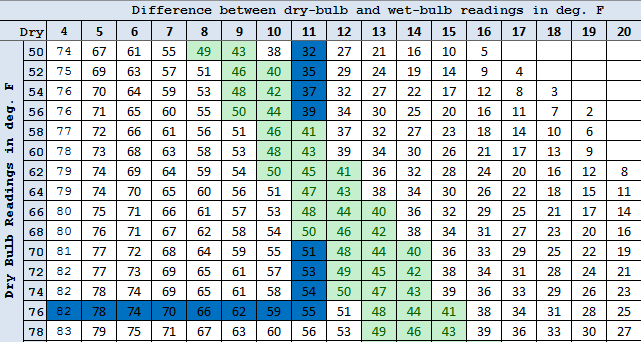 You can find more information on wet / dry readings for humidity, including tables here. However, there are also online calculators 1 where you just enter the wet and dry temperature 2 and you are provided with the resulting %RH. Of course you could just purchase a wet – dry hygrometer instead of making one. Or you could buy one of the many other digital and analog hygrometers that are available. This calculator requires the temperatures to be entered as degrees Celsius. Another calculator: You can enter either Fahrenheit or Celsius temperatures in this calculator – just be sure you enter the temperature in the correct boxes because Fahrenheit goes into different boxes than Celsius. Previous Post:Humidity is up – Guitars come out – Hooray!